Infused with Alpha Hydroxy Acids (AHAs), known to smooth the appearance of fine lines, and Collagen, known to support skin suppleness. 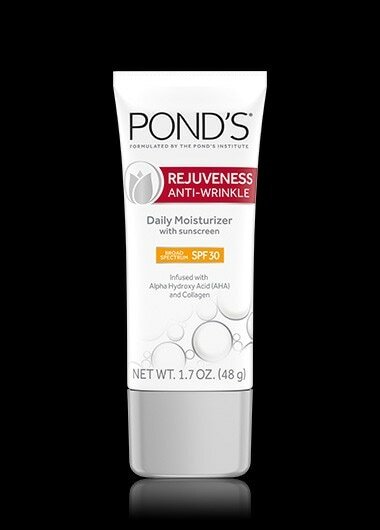 Rejuveness Anti-Wrinkle Daily Moisturizer with SPF is rated 4.2 out of 5 by 29. Rated 4 out of 5 by Debbie Webbie from Lightweight and smooth This product was so lightweight it was light wearing nothing. I expected it to feel greasy since it has sunscreen in it but it wasn’t. It was so smooth. The only thing I’d change is the odor. It’s not bad, just not like the iconic Pings cold cream. Rated 5 out of 5 by Liz159 from Very moisturizing! absolutely loved this product. I thought the moisturizer was going to be completely oily as it felt a bit liquid-y but was pleasantly surprised. It didn’t have a distinct smell to it and applied smoothly I used it under my makeup with no problems. Rated 5 out of 5 by happyshopper12 from Great formula! I really love this moisturizer- it is so easy to apply and smooth over my face, it has a pleasant and light scent, and I love that it has SPF and helps to combat wrinkles. This leaves my skin feeling soft and looking dewy, and I love wearing it under my foundation & primer. Rated 5 out of 5 by LindaSR from Love it!! The consistency is just right, not to heavy for a sunscreen I really love it!! Rated 4 out of 5 by Pond from Smooth This is a great product to help with protection of sun ray. How ever for my skin texture it broke my face out because I have been having some issues with skin damages. Rated 5 out of 5 by babydragonfly from Great spf moisterizer Pond's Rejuveness Anti-Wrinkle Daily Moisterizer with Sunscreen goes on smooth & feels good. All in all a great SPF moisterizer. Rated 5 out of 5 by Riley from Great for guys too This moisturizer did leave my skin feeling smoother, and it is absorbed easily. A little bit goes a long way, so this tube will last a while. Although I'm not a fan of the scent (I typically prefer unscented lotions/moisturizers), it doesn't linger long so I forget about it as soon as I'm out the door. Would definitely recommend and will probably make this my daily moisturizer.